I am a technical writer with a passion for writing on emerging technologies in the areas of mobile application development and IoT & AI. Lately, app stores have witnessed a meteoric rise in the number of apps available to them. Because the competition is so fierce, it is exceedingly important to deploy an acknowledged mobile app development process so as to intensify your odds of delivering an endearing product. Let’s have a look at the different stages involved in the mobile app development lifecycle in detail. This is the first and the most significant phase as it will lay down the requisite groundwork for all the following stages. Being an app developer, you need to gather as much information about your client’s business as possible and understand his expectations from the app. What is the prime aim of your app? Are you developing an app to augment brand connectivity? Are you looking to improve your customer service? Or are you looking to enhance real-time cooperation amongst your workforce? Well, it is immensely important to clearly define the purpose of your app and know how your users will benefit from it. Make sure there is adequate clarity regarding the list of tasks you want your users to perform with your app. Who are your target app users? Understanding the demographics of your target app users is highly significant in order to formulate a suitable app design, features, and functionalities. It is only after assessing the precise requirements of your target users can you develop a robust app prototype that matches your client’s vision. After conducting extensive research and brushing up on your concept, you and your client will come up with a broad list of features that should be included in your app. However, it is crucial to understand that all these features cannot be integrated with the primary version of your app and there should be certain features that you can save for app upgrades. So, settle for the minimum set of features that bring out the prime functionality of your app. Remember, simplicity is the key to developing a triumphant app. Your app should have the ability to realize its objectives with as few features as possible. 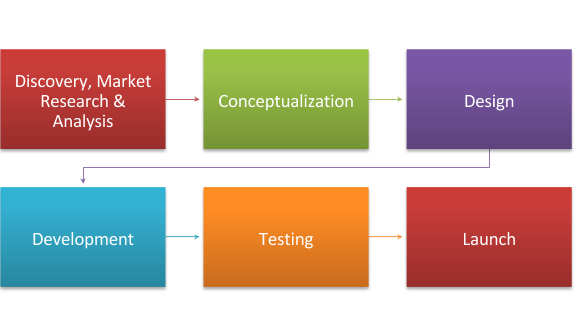 This is the key phase of the entire app development process. A failure to properly conceptualize your app idea can cause the entire development process to be in vain. You need to come up with a whimsical app concept that arouses interest among your target users. Have a look at the top grossing apps on Google Play and Apple Store in order to pinpoint the prevailing trends that are creating a buzz among the audiences. Do not imitate existing apps but draw positive inspiration from them. Apprehend what these apps are offering to their users in terms of design and functionality to come up with your own ingenious ideas. Additionally, you need to address the following questions to powerfully conceptualize your idea. What special functionalities does your app offer to give it a competitive advantage? If there are a plethora of similar apps available in the app stores, then there has to be a strong reason for the users to download your app. Identify your offering’s differentiating qualities and focus on making your concept more unique and pioneering. Your app concept should be well-aligned with the core objectives of your client’s business. A mobile app is an extension of your business that always reminds users about your offerings. Therefore, make sure that it is an exemplification of the best that your business has to offer. Make sure that your app concept is driven to satisfy the widest customer segment. Since you have already defined your target users, try to devise features that match their needs and preferences. Will you be able to do proper justice with the execution part? Is the mobile platform that you have chosen appropriately for the kind of functionality you wish to incorporate? Do you have adequate access to all the adjuvant technologies required to carry out your app execution? This is the stage when you begin working on the look and feel of your app. By now, you have a fairly good idea about which features will be integrated into your app design, and so, its time to begin drafting your app. You can sketch the different screens your users will navigate through in order to perform a specific function. You can also map out the various user journeys across the app in precise detail to better understand the user experience. In what context does a user open/operate your app? How much time and hits does it take for the user to create his profile? How can a user find out new content on your app? Once you gathered all the necessary information, it is time to create wireframes of your various app screens. You can make use of an adept wireframing tool known as Balsamiq. Develop different screen layouts with an eye to detail. Include buttons, icons and other visual elements so that the app designers have a meticulous framework to adhere to. Observe unique design placements for each platform. However, at the same time, do not move away from basic concords such as the size and placement of back and skip buttons, etc. Try to innovate by developing numerous variations of the same screen by experimenting with the placement of different visual elements. This will help in facilitating a better and improved user experience. Once you have created an app wireframe, it is easy to understand the backend which will be needed to sustain your app functionality. You can decide if you will be able to host your app on an off the shelf mobile backend or if you need to build a robust backend from scratch. Also, at this stage, you might have to amend your wireframe in case of any technical shortfalls. After the wireframe has been finalized, it's time to build an interactive app prototype. A prototype will help in giving the client the first look at your app. Alternatively, you can gather a bunch of reliable people and ask them to interact with your prototype. This will help you gather useful insights into your app’s functionality and correct any shortfalls identified during the process. There is a multitude of online tools that can help you to create robust and reliable app prototypes sans any coding, for example, InVision, Marvel, Proto.io, and Origami. After you have created a prototype of your app, you need to build its backend by setting up storage solutions, servers, APIs, and databases. Alpha Stage: By this stage, the app exhibits all core features and functionalities. However, it has not been tested and supplementary features are yet to be incorporated. Beta Stage: By this stage, almost all the features that were decided have been added to the app. It has gone through light testing to fix major bugs. This is the time when you can introduce the first version of your app to a select group of customers to identify any app insufficiencies. Release Candidate Stage: By this stage, your app is free from all glitches and ready for its release. Following that, you need to create a developer’s account on the respective app store where you wish to distribute your app. This may take a couple of days. Also, take time to go through the comprehensive app store guidelines and understand their practices to ensure that your app does not get precluded during the review process. At this stage, you have a fully-operational app with interactive graphics. It is time to put it to rigorous testing in a broad range of real-world scenarios to identify any technical faults. It is always a good idea to begin testing your app from the early stages only as this helps to keep the final costs considerably low. As you go up the development process, it becomes costlier to fix bugs. There are numerous online tools that you can use for testing your apps such as Testflight, Bugsee, and Appium. The success of your app depends upon this step in a large way. The basic aim of this stage is to introduce your app to a maximum possible number of customers and receive innumerable downloads in the very first go. This step calls for investing a lot of time and effort in order to ensure that your app gets into the hands of several users. ASO (App Store Optimization): A lot of users generally depend on app stores to locate new and engaging apps. Thus, it becomes highly significant to improve the ranging of your app on the app stores so that it catches the users attention. SEO: Formulate a list of effective keywords for SEO purposes that help in making your app discoverable. Prepare articles, guest posts and optimize your website prior to launching your app to engage the potential customers. Paid Advertisements: You can exploit the platforms of Google, Twitter, Instagram and Facebook to run paid advertisements. This can be an effective way to seize the attention of prospective customers and augment the number of downloads. Emails: You can keep your customers engaged by sending formal emails much before the actual launch of your app. This will accelerate the initial app download rate, thus inflating the chances of your app trending on the stores. The foremost thing to remember is that app development is a continuous and ongoing process. It just doesn’t end with you launching the final output, in fact, it is just the beginning. As your app gets more users, more reviews and feedback will pour in and you will have to integrate the needed changes in the form of future app updates. If this is your inaugural attempt at app development, follow the aforementioned steps to make your app reach the zenith of success. Additionally, you can get in touch with a reputable Android app development company to get hold of a triumphant app.